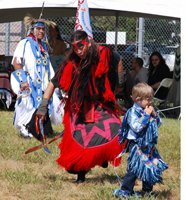 The Native American Festival on Sept. 14 and 15 features traditional dancers, singers, drumming, crafts, artists’ demonstrations, authentic Native food, a large silent auction and more. This pow-wow is organized by the Nause Waiwash Band of Indians, made up of descendants of local Nanticoke Indians. The event happens rain or shine. The festival is held at the Vienna ball field. Follow the from Route 50 to Vienna and to the festival. Saturday hours: 10am-5pm. Sunday hours: 10am-4pm. Grand entry is at 12pm both days. Admission: $5 for adults and children 7 and older. Children 6 and under and guests with an active military ID enter free of charge. For more information, call 410-228-0216.